And with this, the Liturgical Calendar underwent some fairly substantial changes from what had been before. As is the case with my occasional posts on the Catechism, here and here, I possess neither the expertise nor the time to make commentary as to whether these changes were good, bad or indifferent. My hope is to simply point out some of these changes from time to time as we go through the Liturgical Year. Folks already “dialed in” to the Extraordinary Form are aware of much of this; folks for whom this “EF thing” is new, maybe not so much. So, my point is simply to make a by no means exhaustive survey as we travel through time together. Let us begin with a very broad brush: what did the liturgical year look like before M. paschalis (“BMP”)? 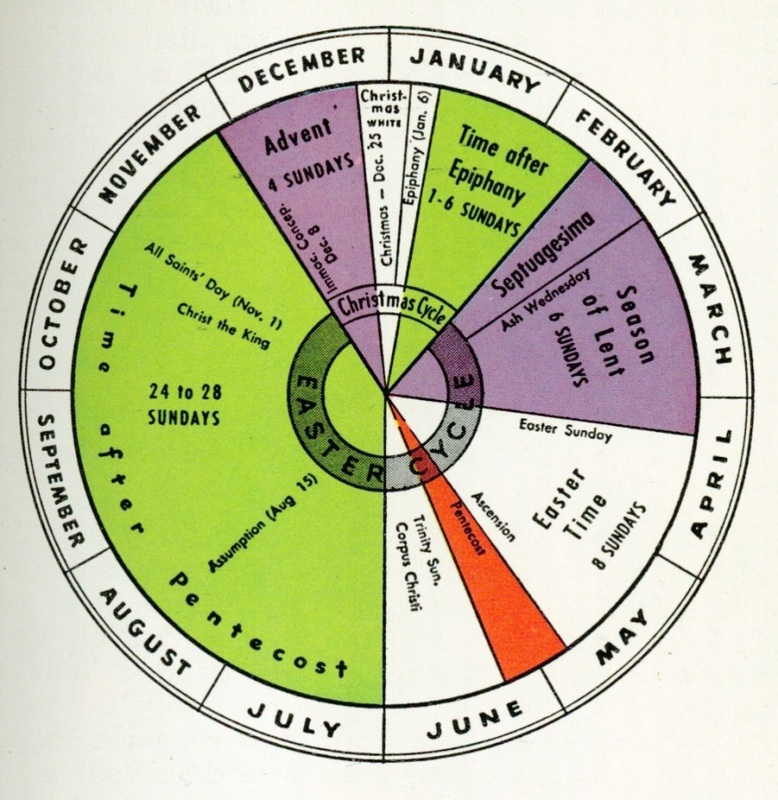 BMP, the Liturgical Year was divided into two cycles: the Christmas Cycle and the Easter Cycle (follow along on the handy “Liturgical Year Wheel” reproduced below, the one on the left). The Christmas Cycle, in turn, was divided into three pieces: Advent, Christmastime, and the Time After Epiphany. The Liturgical Year, and the Christmas Cycle, both begin with the First Sunday in Advent. Advent runs through the next three Sundays up until Christmas Eve. The color of the vestments is purple, and the period of Advent includes the Feast of the Immaculate Conception, December 8th. Christmastime, the second part of the Cycle, goes from Christmas Day until the Feast of the Epiphany (“the twelve days of Christmas”). Vestments are white. Then comes the Third Part of the Christmas Cycle, the Time After Epiphany. This runs anywhere from one to six Sundays, and ends the evening before Septuagesima Sunday, and the vestments are green. Thus endeth The Christmas Cycle. 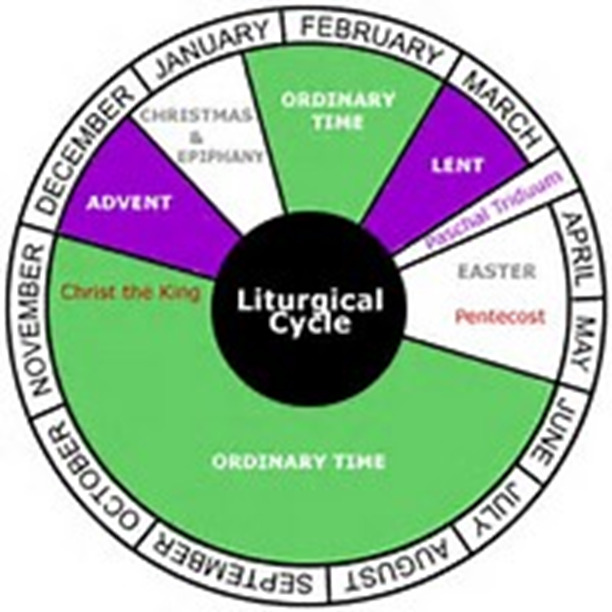 The Easter Cycle is also divided into three sections: Septuagesima (or, the “Pre-Lenten Sundays”), Season of Lent, Eastertime, and the Time After Pentecost. Septuagesima begins, appropriately enough, with Septuagesima Sunday, the ninth Sunday before Easter and the third Sunday before Ash Wednesday. There follows Sexagesima Sunday and Quinquagisima Sunday. The season of Lent begins with Ash Wednesday, and runs through Holy Saturday, which ends, more or less, with the Easter Vigil. The three days of the Triduum (Maunday Thursday, Good Friday, Holy Saturday) are there, of course, but the Triduum as such is not broken out as a separate season. Eastertime runs from Easter through Ascension Sunday (8 Sundays). We then have Pentecost and it’s octave, followed by Trinity Sunday and Corpus Christi Sundays, both with their octaves. The vestments beginning with Septuagesima Sunday and running up through Holy Saturday are purple, Eastertime vestments are white (except for Pentecost, rose). We then enter the Time After Pentecost, which runs up to the Saturday before the First Sunday in Advent. Thus endeth the BMP Liturgical Year. What about after M. paschalis (“AMP”)? It’s the same, but different (please see the Cycle Wheel on the right, below). AMP, the Year is divided into four blocks: Advent/Christmas, Ordinary Time I, Lent/Triduum/Easter/Pentecost, and Ordinary Time II. Advent/Christmas are more or less the same, with the same vestment colors, as the BMP Year. However, the old “Time After Epiphany” and the pre-Lenten Sundays (“Septuagesima Time”) have been collapsed into “Ordinary Time I”, and the three pre-Lenten Sundays, as such, have ceased to be. Then comes Ash Wednesday, initiating the Lent/Triduum/Easter/Pentecost seasons. As noted, the three days of the Triduum are most certainly present BMP, but in AMP they are given their own season. Ordinary Time II corresponds to the BMP “Time After Pentecost” plus the Sundays and octaves of Trinity Sunday and Corpus Christi. Thus, OT II after Pentecost, and runs up to the Saturday before the First Sunday of Advent. Thus endeth the AMP Liturgical Year. Thus the Liturgical Calendars, BMP and AMP. There’s a lot more than this little overview mentions: many feast days have been changed/suppressed/added or the dates they are celebrated have been changed, readings of course have been extensively changed (a discussion of the thee year AMP Liturgical Cycle – A,B and C Years – is way beyond this little post), but gives us an introduction. As we progress through the year we will look at each season a little more closely, but that’s just enough for now. Finally, I have included (below) a couple of cycles of a secular sort which I occasionally find useful in the daily grind.